One of two strange versions delivered to ECOC at about the time as the first RESLs were being delivered. Who would put a centre door on an MW with its very high centre section of chassis bearing the engine, instead of waiting a few months for a Bristol RE with its unencumbered central lower frame? The centre doors didn’t last long, I understand! I think one of them became the Kings Cliffe outstation (Northants – the furthest outstation from Norwich!) vehicle to carry higher peak loads! Thank goodness for OMO double decks very soon after! The above photograph was taken at Cremorne Lane Works, Norwich on Feb 11, 1967 before the bus entered service. It is nice to know that ECOC buses had destinations other than "SERVICE" available! Strange indeed, Geoff. Thanks for posting. Why would anyone in Bristol or ECW want to produce such a beast, knowing that the RE was on its way, and why would Eastern Counties want it? Stockport had dual doorway Leopards and Manchester dual doorway Tiger Cubs, Panther Cubs and Panthers and had double decker OMO working not been made legal, would have had many more Panthers. What a different MW. Was this an Eastern Counties one off or were did other Tilling Companies have them? Strange to see the glazed roof coves, on both sides too. Also I would have expected the exit door to be in the next bay forward of where it is. Well, to answer your question about who would put a centre door on an MW, Wilts & Dorset did the same to a converted coach. I think it ran for a few years in that form, but I cannot find any photos on the web at the moment. Thanks for that, Nigel. Converting a down-graded coach is one thing, and I think I have a ‘bought’ slide of it somewhere – I’ll see if I can dig it out for others to see if they wish – but one straight off the factory line? This was an attempt, it seems, at a standee bus but where for, I know not. I thought there were some similar Leeds efforts on this site with steep steps and standee windows, but can’t spot them- did they try one or two types? The centre door as placed would be the only option – the bay further forward had the engine oil sump come well over to the nearside. The glazed roof coves look to be the ‘standard’ parts from coach MWs and presumably were added because of the standee nature of the bus (for the same reason as Reading’s REs had very tall side windows). Joe, Leeds had saloons with centre entrance bodies all bodied by Roe and all featuring the standee windows. They were repeated on the AEC Swifts with Roe bodywork delivered in 1967. The original standee saloons were on Guy, AEC and Leyland chassis with a later pair of Reliances entering service in the late fifties. There is a photo of this vehicle when new in MG Doggett & AA Townsin’s book ‘ECW 1965-1987’. It was one of two trial dual-door standee MW5Gs (LM640/641) delivered to ECOC in November 1966. Each was capable of carrying 60 passengers – 30 seated and 30 standing – but were of differing internal layout. The accompanying caption states "the area for standing passengers was concentrated at the rear of LM640(KAH 640D), there being single seats on each side of the gangway towards the rear to provide a standing area behind the exit doorway". An interior shot of LM640 shows this feature, together with normal double seats at each side ahead of the exit door. Relating to the second standee MW LM641(KAH 641D), the authors state that "a row of single seats were provided along the offside of the vehicle to give room for a standing area along its length". 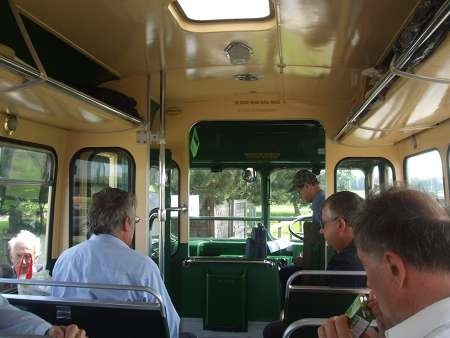 A picture of the interior shows this together with a longitudinal seat over the front offside wheelarch, plus normal double seats along the nearside from front to rear. Regarding Geoff’s comment about the height of the steps at the central exit, dual doorway REs also had steps there as the RESL/RELL chassis sloped up gradually towards the rear in order to clear the engine. The exit steps were probably shallower on the RE, but being just ahead of the rear axle I would not have thought by very much though. A fascinating pair of vehicles indeed, and thank you very much for posting the photo of LM641 Geoff. Wonderful. In my response to Nigel Frampton’s comment, I said I thought I had and would try to dig out a slide of the Wilts & Dorset converted coach. It’s attached, as is a view of one of Lancaster’s trio of twin-door Leopards. BOTH are bought, and I’ve no idea who took the originals. The Wilts came via Paul Caudell and the Leopard came via Arnold Richardson’s Photobus collection. What makes Wilts & Dorset RMR 992 look even more odd is the old coach-type forward door and its kink in the pillar. 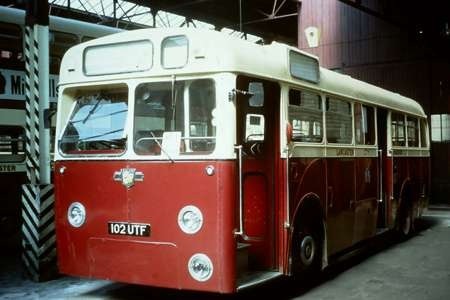 So far as I can recall, 101 to 103 UTF were the only twin door vehicles Lancaster bought (prior to the merger with Morecambe & Heysham) and I think it must have been something of a failed experiment – the centre door was hardly ever activated on the services I used. Wilts & Dorset RMR 992 is seen at what looks to be Salisbury Bus Station and Lancaster 102 UTF is inside Kingsway depot. 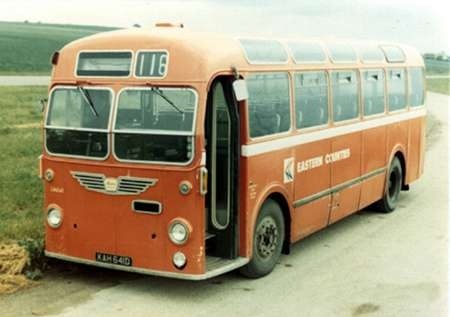 Never thought I would find myself contributing to a post on an Eastern Counties MW but KAH 641D was the only one of its type that I have ever driven. This came about after ECOC took over Burwell & District Motor Services on 10th June 1979. The new regime, under a youthful Ben Colson went to great lengths to cover B&D commitments as required by the Traffic Commissioners at the time. B&D operated a contract/service (not 100% sure which) at the time to carry pupils from Burwell to Soham Village College which parents had to pay for as the free option was for Burwell pupils to go to Newmarket Upper School, for which B&D provided 3 or 4 buses daily. This bus was drafted in briefly to cover odd runs and my diary records that on Friday 15th. June 1979 I was on a rest day but came in to cover the 08:15 Burwell-Soham service 116 with LM641. This journey was made a short working of the established (and much missed) service 116 from Newmarket to ELy, via Burwell. Fortunately I had my camera with me and stopped in a layby on the way back to Burwell to take a photo as I have always tried to keep a record of every vehicle that I have driven. I was able to wind on the correct route number but with no blind fitted it was not even possible to display the favourite ECOC destination of SERVICE! My PM duty was 16:00 Newmarket school-Burwell with the same bus, no doubt I was paid more for those 2 short journeys as a rest day working than I would have earned from driving back and forth all day from Burwell to Cambridge with B&D. The best thing in my memory of ECOC was the wages, as I only lasted 3 months before they gave me till the end of the week to join the union, so I gave them till the end of the week to find another driver! 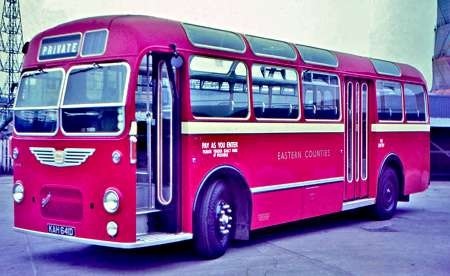 Another batch of two-door underfloor engined single deckers was London Transport’s RW 1-3 the experimental AEC Reliance/Willowbrook delivered in 1960 and sold to Chesterfield in 1963. The exit door on these was one bay further forward and they also glazed cove panels five on the O/S but only three on the N/S none being fitted over the centre door. Rochdale had two batches of AEC Reliances with dual door bodies. Weymann bodied 16-20 and East Lancs bodied 21-23. 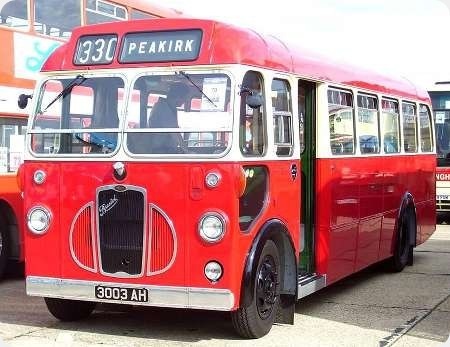 The East Lancs version had the ‘centre’ door further forward, immediately behind the front wheel while the Weymanns had it just in front of the rear wheel. These buses were all introduced as opo vehicles onto routes previously worked by double deckers which at that time in the early sixties obviously had conductors. The dual door arrangement was intended to speed up boarding and alighting times to counter the delay of the driver having to collect fares. Looking through the comments made me think and check out my memory and I found yet more two door underfloor single deckers in the form of Lincoln City Transport No’s 81-87 Reg No’s MFE 993-999 Tiger Cubs with Roe B41D bodies with the exit door just in front of the rear wheels new in late 1958. 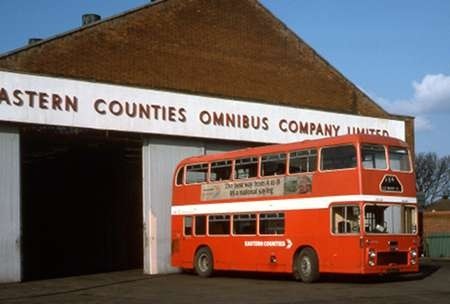 Also Portsmouth Corporation had a batch of Tiger Cubs No’s 16-25 Reg No’s TTP 990-999.
with Weymann B34D bodies with the exit door in a similar position new in May 1960. This is becoming a very interesting discussion. My point was that, until the advent of the AEC Swift, Leyland Panther and Bristol RE was that twin-door single deckers were something of a rarity and, yes, even then, many fleets stayed with the single door. All I can think of was that it may well have been an experiment to see if loading/unloading times improved, and by how much, in the early days of one-man operation. My experience is that most operators went back to single door vehicles. Although not common-place in the early 50s, more underfloor engined single deckers were built as dual door saloons by Bristol/ECW than the ones mentioned so far. Over a decade before the MW, ECW bodied one of the prototype Bristol LS (NHU 2) with dual doors – in that case with the additional doorway behind the rear axle. 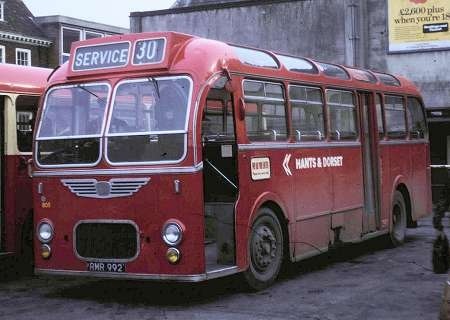 Hants and Dorset’s bus bodied LS were all delivered in that format, though converted to front door only in the late 1950s, and United Counties also had batches in similar style, some as DP rather than bus versions, whilst Wilts and Dorset had several batches of dual doorway DP LSs. I think Eastern National may also had an example to that layout. The structure of an LS frame was such as to dictate the position of the rear doorway. Here we see RMR 992 again now with "Hants & Dorset". It seems to have had a rather hard time of it since it was last washed. Such damage in service is so typical of the drop in standards once NBC took over. I say this because the vehicle is clearly not in a depot. Do we know where this photo was taken, David? And I notice that H&D has adopted the useful ECOC destination of SERVICE! Chris, the later photo of RMR992 looks to be in Salisbury Bus Station. W&D did also make use of "Service" in the destination displays, although not as much as some. Yes, RMR 992 could still have looked a handsome bus, even with its rebuild to bus use. The mid-door for exit is reasonably done, and the revised indicators are very neat. Even the metal trim below the windows has been retained. However, we sadly miss the Tilling red of Wilts & Dorset or Tilling green of Hants & Dorset, either of which would make this a bus to be proud of. Sadly, this didn’t happen here, with the side dent, and it’s need of a wash. The use of "service" as a destination is also regrettable. Hopefully passengers had a good ride, as it retains the upper windows to lighten the interior. RMR 992 is on the stand, reversed in, in Salisbury bus station. The bus station layout was a reversed L with access from the offside of the bus. It was in the seventies that buses started driving on to this stand and reversing off,rather than reversing on. 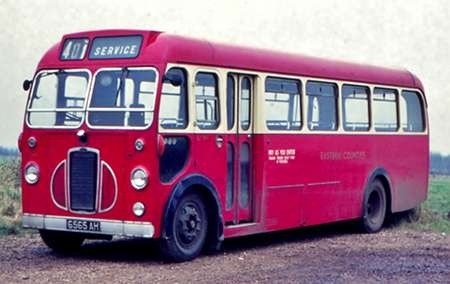 According to BBF No 1 Portsmouth Corporation had a batch of 10 dual Door PSUC1/1 Tiger cubs Nos 16 – 25 in 1950 and 31 Leopard L1s Nos 131 – 161 in 1961/62/66. Of course the London Reliances were based on the Grimsby Cleethorpes design of which there were 24 (the last ones to the later BET design) and both Chesterfield and Aberdare were also customers. Barrie Lee has correctly identified the Tiger Cubs of Portsmouth (Nos 16-25, delivered 1959 and into service 1960), but the L1 Leopards were Nos 131-142 (1961) and 143-149 (1963). They were all dual entrance/exit, the Tiger Cubs being B34D+26 (soon altered to B32D+26 for a luggage rack), and the Leopards were all B42D+16. If I recall correctly, the main "standee" space was centrally placed opposite the exit doors. The saloons numbered 150-161 were Panther Cubs new in 1967. Portsmouth had a possibly unique arrangement for the exit doors. Some time ago, I contributed an article about it on this site, "One Small Step for a Portsmouth Passenger". This arrangement applied to these and all succeeding saloons, plus later Atlanteans until the arrival of the Leyland National. Halifax JOC took delivery of a solitary L2 Leopard with Weymann two-door body in 1961 (231, OCP 231). It was not viewed with favour by the drivers’ union membership and I believe the centre door remained closed in service. It lived a shadowy existence in this form, being mostly banished to working the local Field Lane and Oaklands services based in Brighouse. Another sixteen similar Leopards based on the more appropriate L1 chassis and with single door layout were due in 1962, and 231 was soon sent back to Weymann to be rebuilt to match them. Regarding RMR 992: did this just retain an unpowered front coach door after conversion to dual-door configuration? – both photographs suggest the door is locked open. I remember traveling on RMR when it found itself at Romsey outstation and I’m sure the door front door was electrically run as it was one-man operated (as we used to know it!). I am reasonably sure that, in David Grimmett’s photo of RMR 992 (23/03/16 – 05:43), the vehicle is, in fact, still in Tilling Red. It is the same shade as the adjacent LH, which is clearly still in Tilling livery, the cream window surrounds being the determining factor. Accepting that colour reproduction can vary on different computer systems, monitors, etc, but this colour looks quite different to the rather orangey appearance of NBC red in the first couple of years. H&D applied NBC style fleetnames to a lot of vehicles that were still in Tilling liveries, and this roughly followed the instructions of the NBC corporate image policy. However, that required the cream relief to be repainted white, even if the complete vehicle was not painted, and that white fleetnames should be applied. In practice, H&D seem only to have used a few white fleetnames in this way, and most of the temporary ones were cream, which better matched the original livery, and the cream relief was also left untouched. Presumably, since RMR 992 didn’t have any cream relief, it was deemed appropriate to use a white fleetname. H&D and W&D purchased several single deckers with dual doors from the 1950s to the early 1970s, but there seems to have been a distinct absence of logic. 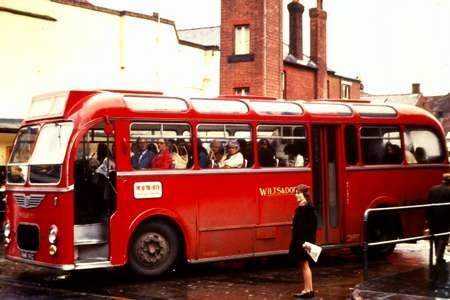 The LSs all seem to have been rebuilt to single door configuration quite early in their lives, but then, from the mid 1960s, virtually all new single deck buses had two doors – the Bedfords, the RELL buses, and even the first deliveries of LHs. The RELL DPs had only one door, but soon tended to be used interchangeably with their dual door bus-seated sisters, particularly when the earlier DPs were replaced on longer distance services by newer deliveries. The passengers were no doubt simply confused, and probably found the five extra seats of the DPs more useful than the extra door. When Leyland Nationals took over from REs as standard single deck fare, the dual door policy was abandoned altogether. The motto of 360 Squadron, Royal Air Force, seems to apply in Nigel’s explanation of the H&D/W&D liveries under NBC – CONFUNDEMUS (We shall throw into confusion). Peter D mentions older two door ECW LS bodies. They were built in the era before OPO (if that is the PC phrase). I suspect that the management attitude was that the conductor would be at the rear to look after that door, despite being power operated. I am sure most conductors would gravitate to the front to chat to the driver. The ‘Do not speak to the driver…’ notices were a later addition required for the certification of a vehicle to operate OPO. With regard to ECOC LM641, I was interested to see that two vehicles had different internal layouts. I was area engineer in the east then and both vehicles probably ‘went west’. I also surmise that the vehicles were part of GM Tom Skinner’s innovations see Eastern Counties – selected memories and that they may have been initiated before the delivery of REs was anticipated. The final MW deliveries were getting so late that many Tilling companies had their orders truncated and centrally(?) replaced by RESLs (the nearest replacement, rather than RELLs). I don’t think the 46 seater RESL caused Union problems at ECOC, being one over the more normal 45 seat maximum, but going beyond that certainly needed negotiation in all companies! In Jim Neale’s photo of LM641 from 1979, it is interesting to see that the last nearside quarter light has been reglazed with black rubber – the cream version didn’t stay in production for very long. I would have expected the front destination to be so treated, for in the eastern area the MW destination glass was just the right height to hit a tardy pheasant that had been taken by surprise and several needed replacement on outstation based vehicles! The “Omnibus Magazine” of June 1967 states that LM640 and LM641 were allocated to Bury St. Edmunds and Peterborough on March 1st 1967 but had returned to store at Norwich within two weeks. Clearly they weren’t very popular!